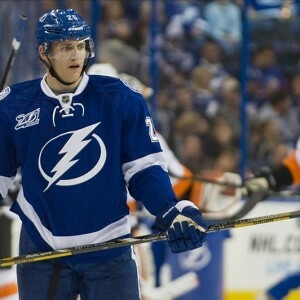 It would be easy to blow out of proportion the Tampa Bay Lightning’s Round 1 Playoff win over the Detroit Red Wings. The five game series won by the Lightning could be viewed by some as monumental considering the team was playing without two of its top players. Both Steven Stamkos and Anton Stralman were unavailable for the entire Detroit series. Most Lightning players have said the right things publicly about not having the services of their top scorer and one of their top defensive players. Cliches about next man stepping up were said by Tampa players throughout the first round. The significance of this playoff victory can be measured in more than a few ways. Unfortunately, for the Lightning as much as any playoff series win is a statement, just as many questions loom. The most glaring question won’t effect the next round at all for the Lightning. That question is whether or not the team can or should play without Stamkos after the completion of this season. When the news came down that Stamkos needed immediate surgery during the last weekend of the regular season, most naysayers assumed the team was done. The series win still doesn’t definitively answer the Stamkos question but the statements made by some on the team are hard to ignore. Sure they clinched a playoff berth for the third consecutive year but any hope of repeating last season’s magical playoff run was seemingly lost without Stamkos who may not see the ice in these playoffs. So, next man up. Fortunately, for the Lightning that next man is budding superstar, Nikita Kucherov. The 22 year-old Russian stepped up big time in the Detroit series. Even playing in the shortest series (5 games) of all the first round NHL playoffs, Kucherov is tied with Joe Pavelski for the lead in the league in playoff goals with five. He is also tied with three others with most points in the playoffs with eight. Kucherov also is tied with three others in most power play goals with three. In the event of the team being unable to re-sign Stamkos before July 1st, Kucherov is showing that he is as dangerous a sniper as there is in the league. Possessing as lethal a wrist shot as there is on the planet, Kucherov is coming of age before our eyes. In the first round he was just about larger than life. Another meaningful development for the Lightning is the emergence of Jonathan Drouin as a postseason player. The impact by Drouin was immediate and profound. Once management recalled the young player from Syracuse for the last two games of the regular season, the team welcomed him back and he scored a goal in each of those last two games. As the playoffs started, Drouin kept it going. While he hasn’t scored a goal, his play particularly on the power play has impressed as Drouin has tallied four assists in the five games the team has played. More than just the stats, Drouin elevated the physical part of his play and improvement in his defensive play has been witnessed. This is good news for both the team and Drouin. Should Drouin continue to want out of the organization, his improved play increases his trade value. If Drouin has a change of heart and wants to stay with the team, the confidence building five games will only feed the desire within the player to show the league what most thought he was capable of when Drouin was drafted in 2013. Thinking about a renewed Drouin and the emergence of Kucherov and you couldn’t blame fans from seeing a rosy future. If Stamkos were to leave via free agency, this would be one of the league’s most dangerous duos. The bad news for the rest of the league is that at 21 and 22 years of age respectively, Drouin and Kuncherov are still learning how to play their game at the NHL level. The worst news is that these two would be supported by players such as Tyler Johnson, Alex Killorn and Ondrej Palat. One last scenario to glean is the way the defensive corps for the Lightning played. Arguably their worst game collectively was the Game 5 shutout pitched by Ben Bishop which won the series. In a game that no goals were allowed, the D-men allowed four breakaways to the Red Wings who are still trying to figure out how to get the puck past Bishop. In the other four games of the series, despite bending at times, they helped Bishop never allow more than two goals in any game. They have allowed 32 shots against them per game but have stood tall enough to support Bishop’s 95% save percentage. In the case of the defense it wasn’t next man up but how many were going to stand up. Starting with Victor Hedman who went from a regular season TOI of 23 minutes a game to over 27 minutes. In addition, Jason Garrison, Braydon Coburn and Matt Carle have all increased their regular season ice time in the playoffs. Garrison, Coburn and Carle represent a combined 27 years of NHL experience including 1882 regular season games. This veteran trio also represents 22 years of NHL playoff experience totaling 257 playoff games. Where they may have lost a half step here or a half step there, they more than make up for it with some good old fashioned savvy. Sure, they may read a play wrong but their experience helps to prevent a bad situation getting worse. For Carle, this bodes well for his future. The subject of trade rumors primarily because of his $5.5 million dollar cap hit that still has two full seasons after this at that rate. Carle is showing GM’s around the league that he is more than serviceable especially in playoff games. Imagine an NHL team on the rise that has some young defenders who could learn a thing or two about how to play the NHL game. Carle could certainly fill that role. As the playoffs move on to the second round and perhaps beyond for the Lightning, Stralman appears to be on the verge of returning. This will only make the team defense who is giving up a little more than 1.5 goals a game even more stout. If Bishop continues to be an extraordinary postseason performer, the team should give their next opponent all it could handle. With one series won and three to go, the Lightning’s Road to Redemption is on the right track. 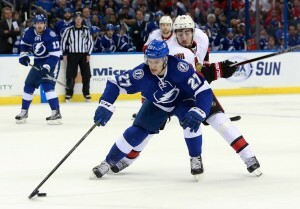 with four victories and 12 more to go, the Tampa players are focused on the prize. Last year’s fun but ultimately disappointing playoff run feeds their hunger. Another series win would be huge. Not where they want to be yet, but huge.